During the month of November, I taught a class for men studying for the permanent diaconate here in the Diocese of Phoenix. One of the texts we used for the short 5-week course was Verbum Domini, the Apostolic Exhortation written by Pope Benedict XVI on the Word of the Lord. This document essentially picks up where Dei Verbum leaves off. Dei Verbum is the Dogmatic Constitution on Divine Revelation from the Second Vatican Council. As we studied this document, the men found the text to come alive, which made them desire the Holy Scriptures even more. 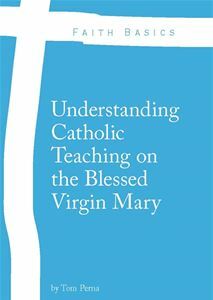 There are many great teachings that come from this text, but for today I would like to focus on paragraphs 27 and 28 – Mary, “Mother of God’s Word” and “Mother of Faith.” As we know, Mary, the Blessed Virgin Mary, plays an integral role in Salvation History. Her “Yes” at the Annunciation does more for humanity than any human person before her and after her. Not only is she the highest created creature in all of Heaven, she is also truly the Un-Tier of Knots, the Immaculate Conception, Ever-Virgin, Advocating Mother, Mediatrix of All Grace, Mother of Fairest Love, Morning Star, and the Theotokos. As is the case with Mary in all of Salvation History, she does not lead us away from Jesus Christ, but brings us to closer to him. She is our Queen Mother who brings our petitions to the King. Just as with our prayers, Mary leads us closer to the Word of God in the Holy Scriptures. 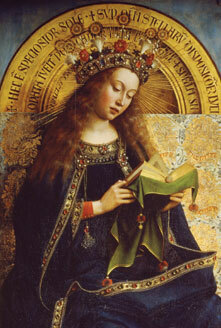 In her Magnificat, she embraces the Word of God, which was always close to her heart.